Bundesliga | Who is RB Leipzig's new signing from Paris Saint-Germain, Jean-Kevin Augustin? Jean-Kevin Augustin won six major trophies in his time at hometown club, PSG, and is now hoping to emulate that at RB Leipzig. Who is RB Leipzig's signing from Paris Saint-Germain, Jean-Kevin Augustin? 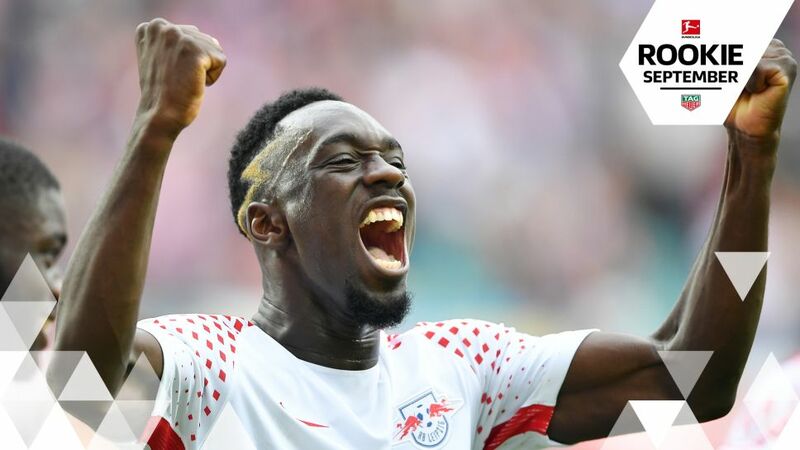 He has outscored Monaco's Kylian Mbappe, idolises Barcelona's Luis Suarez, has learnt from Zlatan Ibrahimovic and is tipped for the top by Lionel Messi, but just who is Jean-Kevin Augustin, RB Leipzig's latest signing? Click here for the full summer transfer overview in the Bundesliga! A powerful, dynamic centre-forward, Augustin's upward trajectory stalled somewhat at hometown club Paris Saint-Germain, with the move to the former East Germany intended to allow his career to take flight. Nominally signed by Leipzig as a replacement up front for Davie Selke (who has joined Hertha Berlin), in reality, Augustin is a very different player and has already made an impact at the club, dovetailing brilliantly with Timo Werner. Whereas Selke is a tall, rangy striker, usually coming alive inside the area, Augustin is powerful, quick, direct and capable of making things happen outside – as well as inside – the box. Watching the now 20-year-old in action as France won the UEFA Under-19 European Championship last summer was proof of that: without exaggeration, Augustin looked every inch a future Ballon d'Or winner, outscoring and outshining his contemporary Mbappe to finish as the tournament's top scorer with six goals in five games. In terms of raw talent, there is little to choose between Augustin and Mbappe, the latter of whom had tongues wagging across Europe last season. While Mbappe has perhaps enjoyed greater opportunities so far in his young career, Augustin will look to render that headstart irrelevant at Leipzig in 2017/18. Indeed, it was Augustin who was chosen as the best player at that tournament, underlining his promise. "I consider myself a creator [as much as a centre-forward]," Augustin told French website onzemondial recently. "I don't think it matters where you play." He went on to add upon his unveiling at Leipzig that he wants to "help the team across the attacking line". Although that creative central striker role Augustin covets is modelled on his idol Suarez, the youngster never quite managed to make the breakthrough into PSG's star-studded first team, despite being at the club since the age of 11. Augustin only made 10 Ligue 1 appearances in 2016/17, scoring once and returning two assists. A lack of regular football, however, is not to say that Augustin failed to develop at PSG; far from it, in fact. Part of the first-team squad since 2015, the youngster honed his striking trade alongside Edinson Cavani and Ibrahimovic, the latter of whom regularly offered tips and tricks of the trade. "Playing alongside Zlatan is very impressive," Augustin told LCI recently. "He's a giant and a huge character. He works all the time and wants to win everything, even in training. That's one of his best attributes. By playing alongside him and watching him, you can only learn." Long tipped for the top, Augustin also featured in Team Messi's ten brightest young players in November 2016, an advertising campaign run by adidas in conjunction with the Barcelona great. "It's not pressure at all," said Augustin of the honour. "I'm not someone who puts pressure on myself. I'm very pleased to be chosen by him." Such potential has long been in evidence at youth level: as well as Under-19 Euro success, Augustin also caught the eye at the FIFA Under-20 World Cup this summer. The Leipzig new boy found the net four times in three games in South Korea (as well as missing a penalty), averaging a goal every 55 minutes. That return would surely have been higher had France not been eliminated by Italy at the last-16 stage. Having now represented France at every youth level, Augustin admits that a full national call-up would be "a dream" and he appears to be in the perfect place to turn that into reality. Young, hungry, keen to prove himself and physically able, the striker fits perfectly into the Leipzig model. He has already adapted seamlessly to Ralph Hasenhüttl's preferred high-pressing style, scoring two and providing two assists in five Bundesliga outings to date. From there, the sky's the limit. Take it from Messi. Click here to vote for Augustin as your September Rookie of the Month!